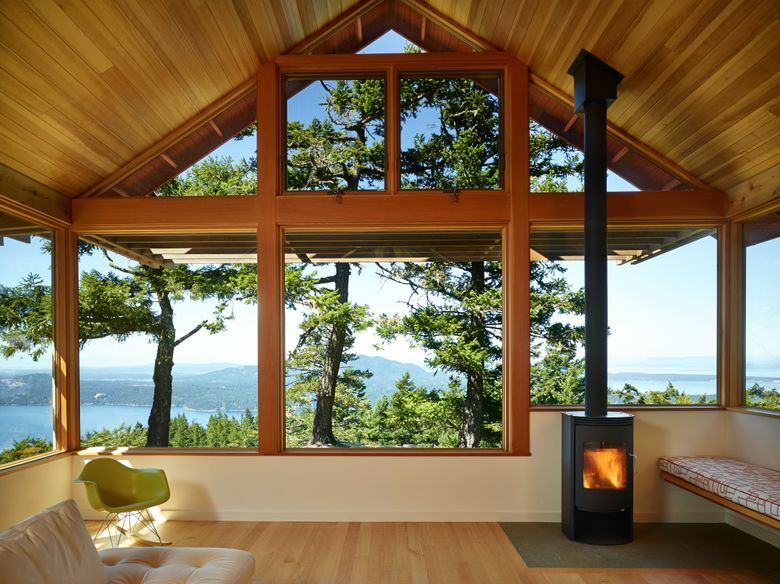 Stoltz Kau Architects designs a mountaintop retreat that is both beautiful and strong, braced for any kind of weather. FOR MANY, THE ISLANDS of Hawaii are one of the most special places on earth. But for Cary Moore, born and raised on Oahu, that designation goes to Washington’s San Juan Islands. Specifically Orcas. Moore, an admitted islomaniac (lover of islands), came to this archipelago’s largest bit of land to deliver his daughter to summer camp. And, in truth, it wasn’t an agent who sold him on the place. It was the cool breeze. Specifically, Moore is speaking of his window in his house high atop Buck Mountain. A place he calls Lanihuli (“swirling heavens”), named after a mountain on Oahu’s windward side. 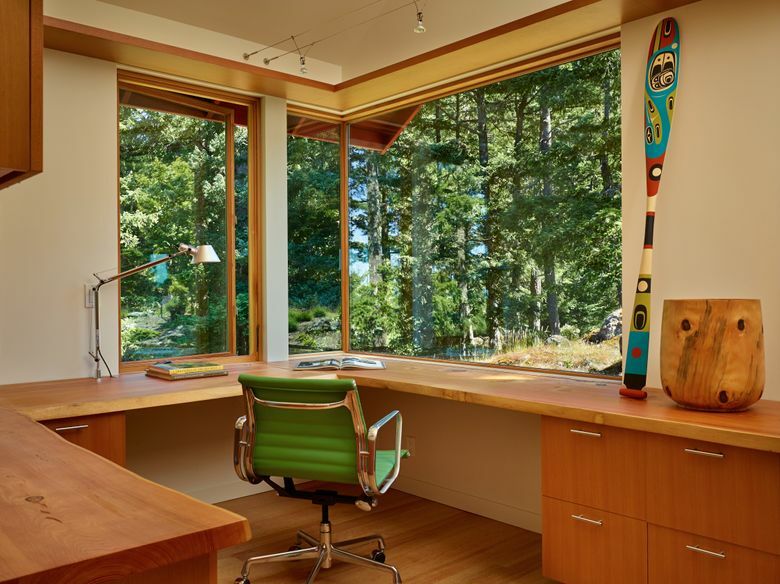 Indeed, it was a fairly quick hop from cool Orcas breeze to cool Orcas house, 1,935 square feet designed by island architects Susan Stoltz and David Kau of Stoltz Kau Architects. “Certain times of the day you can look out and not see any evidence of human existence,” Moore says. It’s true. 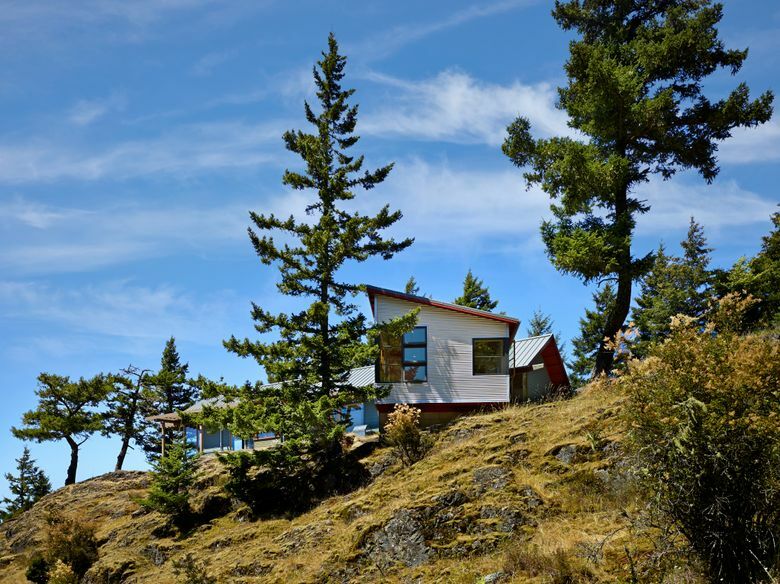 This contemporary mountaintop retreat that launches from a slender ridge has perhaps the best view to be had in our parts: from slabs of lime-green moss-frosted boulders just outside the window, across the deep fir forest and sapphire-blue water, sweeping up to a sky with a watercolor-paintbox of hues. 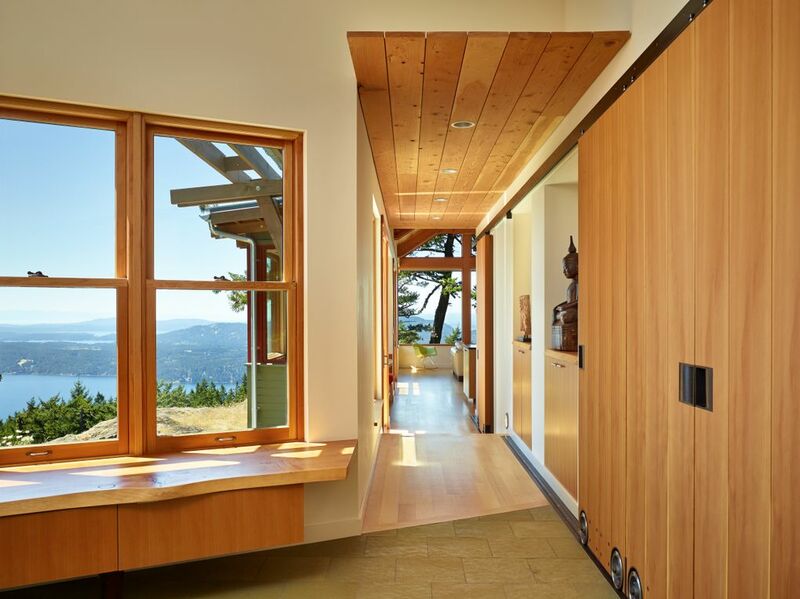 The home is organized around a linear hallway. 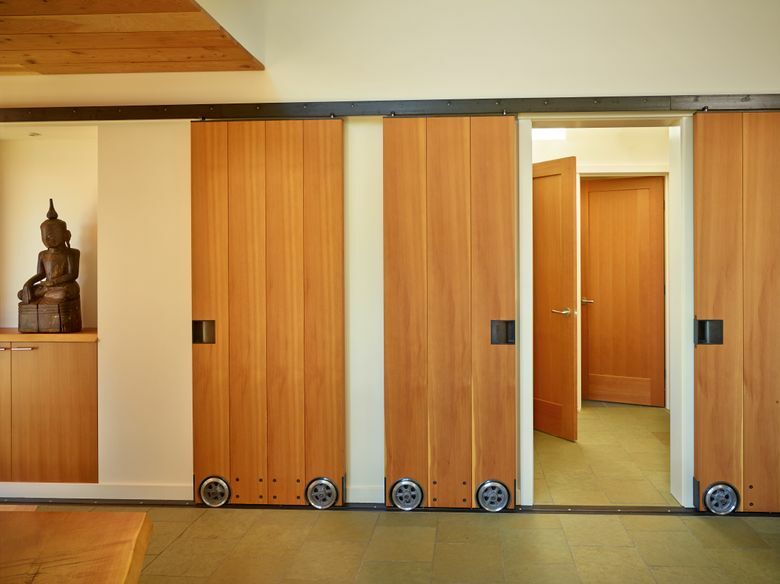 Custom barn doors there, along a 27-foot-long track, can be configured to turn a second bathroom, office and media room/library into a guest suite. On one end of the open great room is a woodstove for warmth. On the other, in the kitchen, a woodstove for pizza. 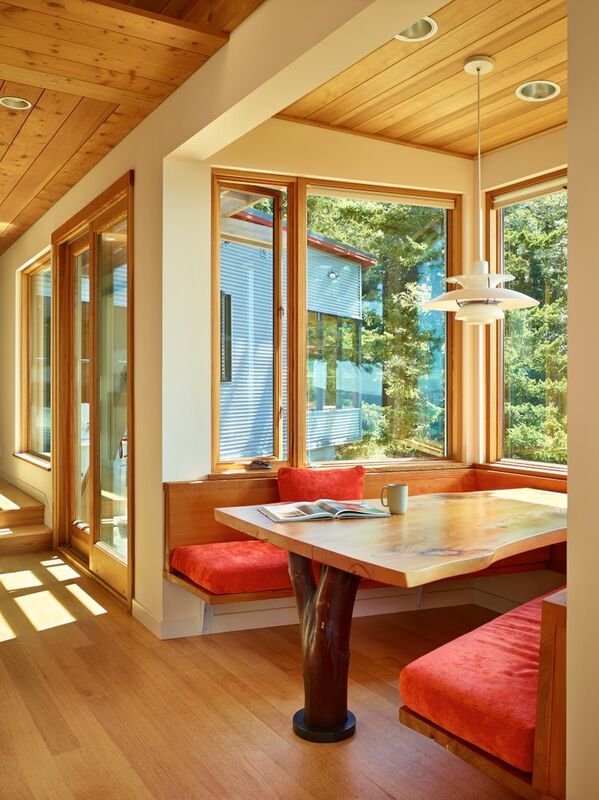 Meanwhile, to the north sits the dining room, and to the south, a Stoltz Kau trademark, a sunny nook. Everything, everywhere always with views. 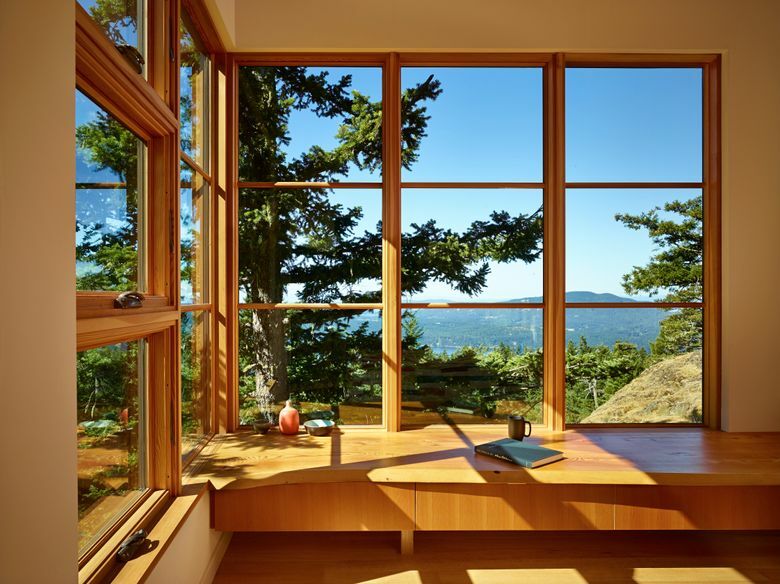 The master bedroom cantilevers (to protect the root system of a tree just outside), taking in views both distant and nearby. 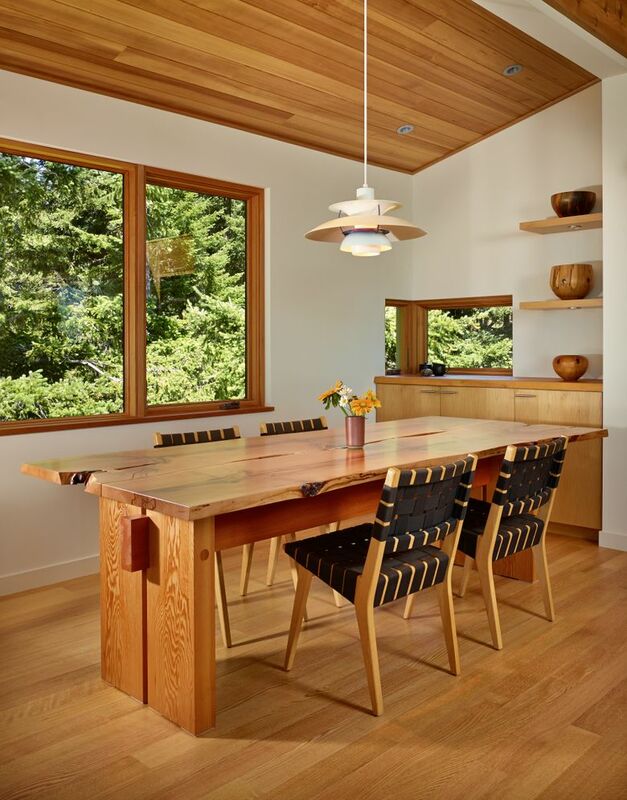 Cabinetmaker Mark Padbury custom crafted enough live-edge pieces to hammer home that cabin feeling. 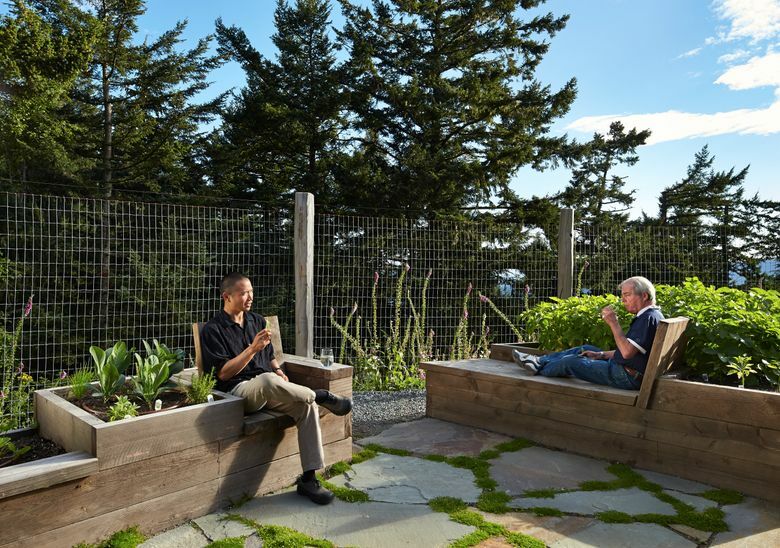 Outside there is a shop building and raised garden beds, two designed as “conversation planters,” a place to enjoy both the plantings and a chat. And while the views here are splendid, the weather can be downright rude. To counter, the exterior is durable and low-maintenance cement panel siding with a metal roof and aluminum-clad fir windows. Moore’s new home means so much to him that at the end of construction he and Linda Hamilton were married there, atop the moss-carpeted slab of rock outside their door, joined together by Padbury, the cabinetmaker. Fine joinery, indeed. 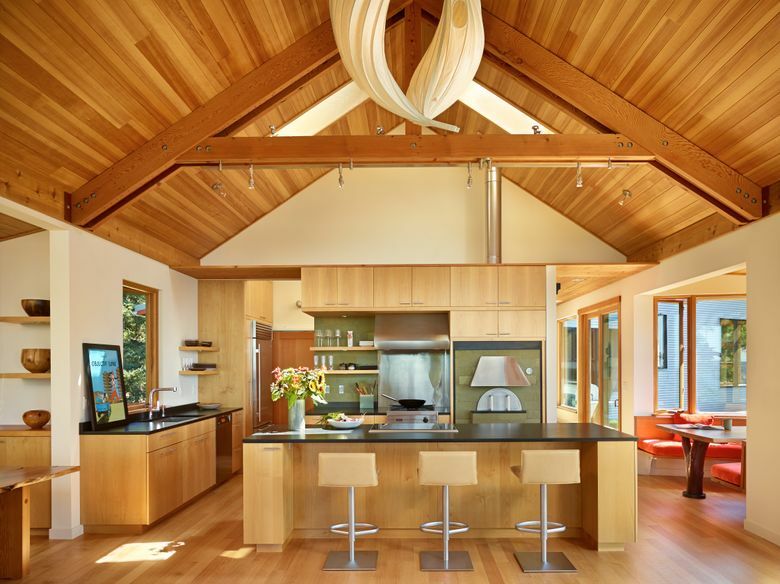 At a project’s end, there is always a punch list of items that need fixing or tweaking. Well, almost always.